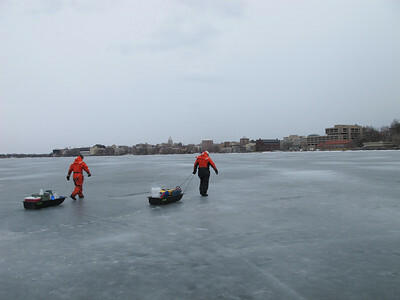 On February 22, 2012, senior research specialist, Ted Bier and facilities manager, Dave Harring, headed out onto the Lake Mendota ice to collect samples for the North Temperate Lakes Long-Term Ecological Research study. The NTL-LTER is one of dozens of sites scattered across the country funded by the National Science Foundation to collect data on all sorts of North American ecosystems. 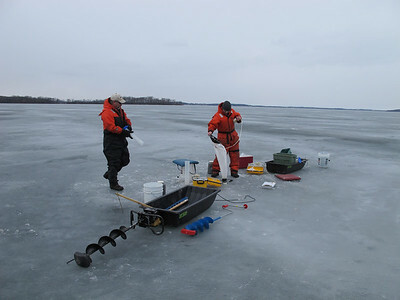 Over the last 30 years, the NTL-LTER has documented conditions, trends and changes in Wisconsin lakes. 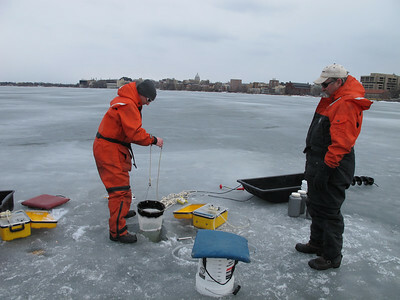 This year, conditions on and in Lake Mendota were anything other than "average!" 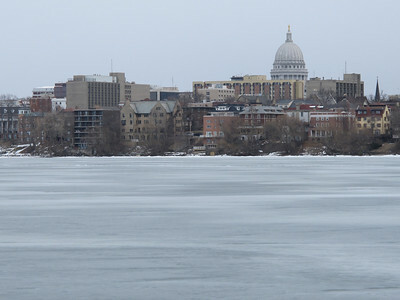 Winter in Wisconsin: The Madison skyline from the frozen surface of Lake Mendota. 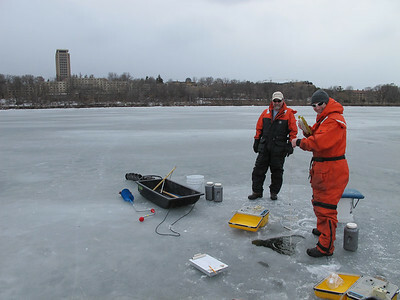 Ted Bier, senior research specialist and Dave Harring, facilities manager, prepare to drill through the ice and take samples for the LTER project. 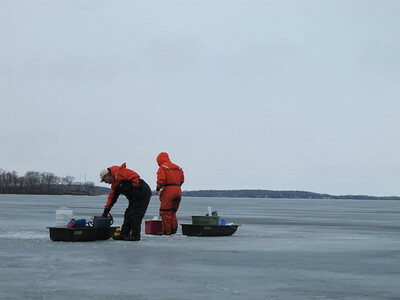 The ice thickness on February 22nd, was 17 centimeters (or just under 7 inches). 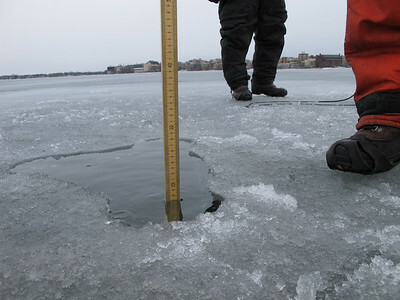 Bier says that the Madison lakes usually have 12 to 18 inches of ice (when they're frozen) this time of year. 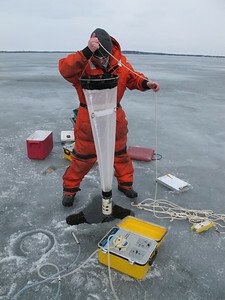 After breaking through the ice, Bier prepares to drop a zooplankton net into the lake. Bier and Harring dropping the net with UW-Madison's Van Hise Hall in the background. 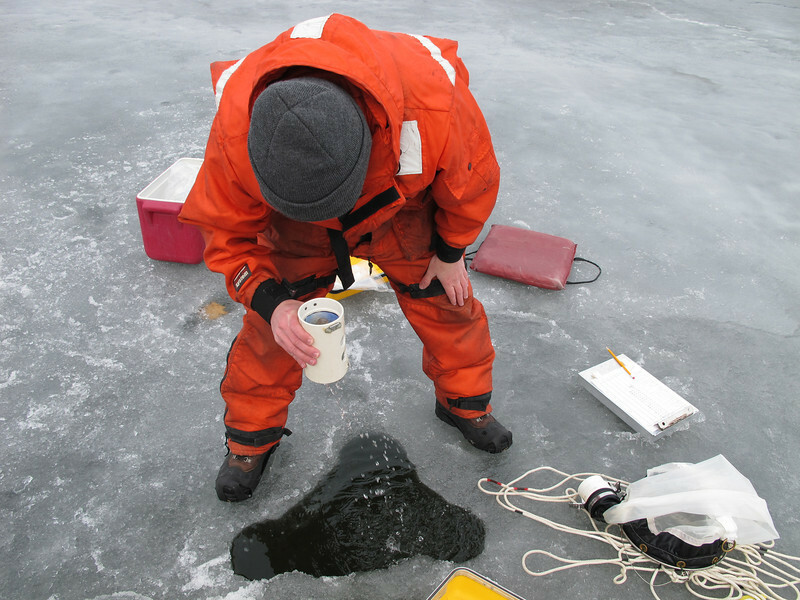 ...more plankton in a winter water sample than he's seen in ten years. Bier pours his plankton sample into a vial. 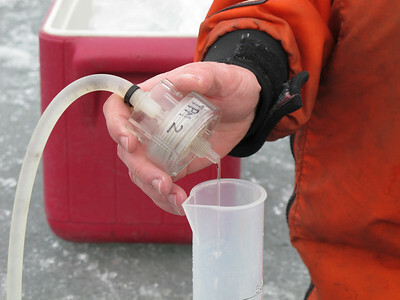 The sample, he says, more closely resembles what he collects in late Spring plankton tows. Winter samples usually contain far less zooplankton and phytoplankton. 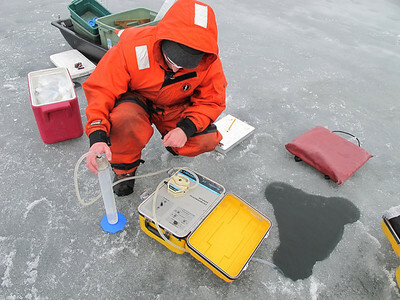 Using a peristaltic pump, Bier takes water from the lake and pushes it through a filter designed to measure the total particulate matter suspended in the water. Again the sample is an outlier in the usual trend. Water runs through the filter until the filter clogs with particulate matter. That usually takes 5 to 8 milliliters of water during ice cover, Bier says. On this day it took 2. 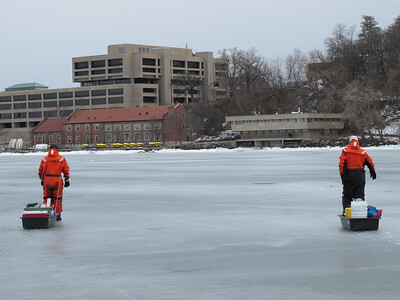 Their samples collected, Bier and Harring take the long walk back to the Center for Limnology's Hasler Lab, where the samples will be analyzed and recorded. 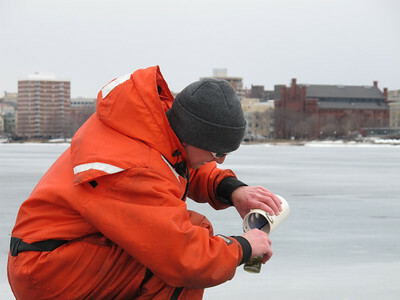 Wrapping up another day at work at the University of Wisconsin-Madison's Center for Limnology.